I had mentioned previously that our tradition of celebrating Thanksgiving with my family since my brother got married. It’s a huge get together. Guess what, this time we won't be celebrating together as my parents are on vacation to India and my brother and family moved to Texas. My sis-in-law and I had been talking over the phone for the last 2 weeks and how bad we are going to miss this huge get together. We are going to miss the most exciting black Friday shopping that me and my sis-in-law does every year just by ourselves by leaving the kids to guys to watch. Kids are very upset too. I promised my kids that we will celebrate Thanksgiving here at home on Wednesday and on Thursday we will have the get together by the Thomas family. 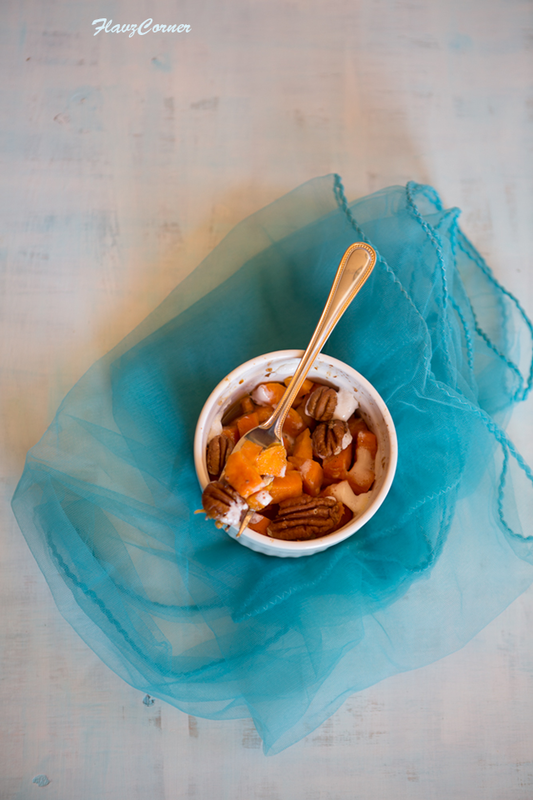 So for this Thanksgiving, I will be making my sis-in-laws sweet potato dessert that she makes during Thanksgiving. I am the one who really finishes all the left over as I am an ardent lover of sweet potatoes. I slightly modified the method and made them in ramekins for individual servings. 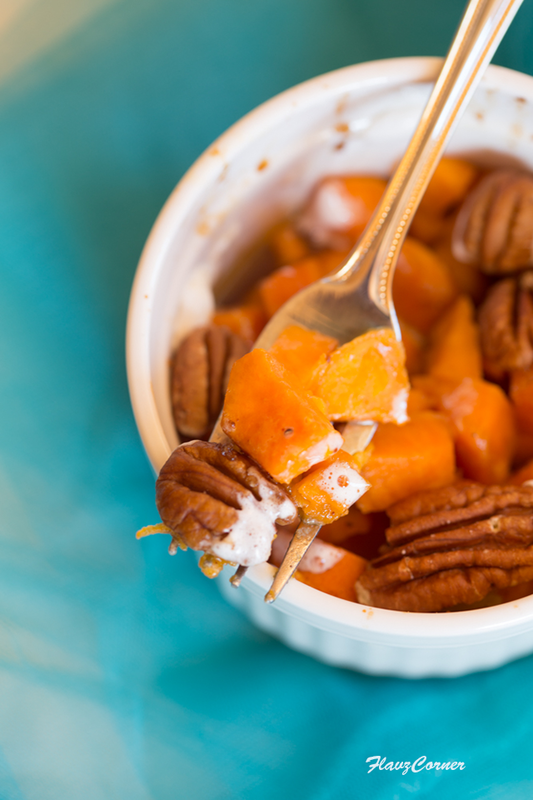 These flavorful candied sweet potatoes are super delicious and go well with Thanksgiving dinner as a dessert. You can set it up the day before and bake it on the day of the dinner. I made a small batch to share before Thanksgiving so that you can try it for the dinner. Pre-heat oven to 400°F. Grease 2 ramekins with butter or cooking spray. 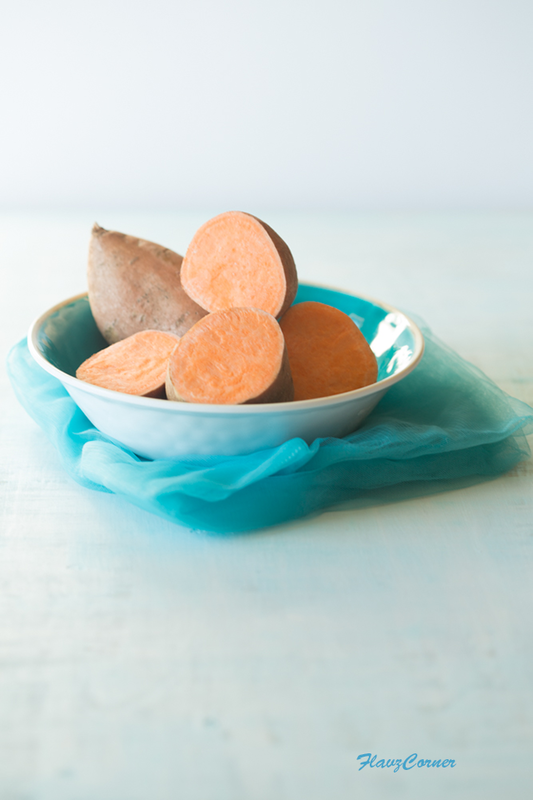 Divide the cut sweet potatoes into equal portions and arrange in the ramekins. Add 1 tsp of butter, 1/2 tsp, brown sugar, 1 tsp of orange juice and 1/4 tsp of orange zest into each ramekins and mix well. Cover the ramekins with aluminum foil and place them on a baking sheet and bake it for 30 minutes. 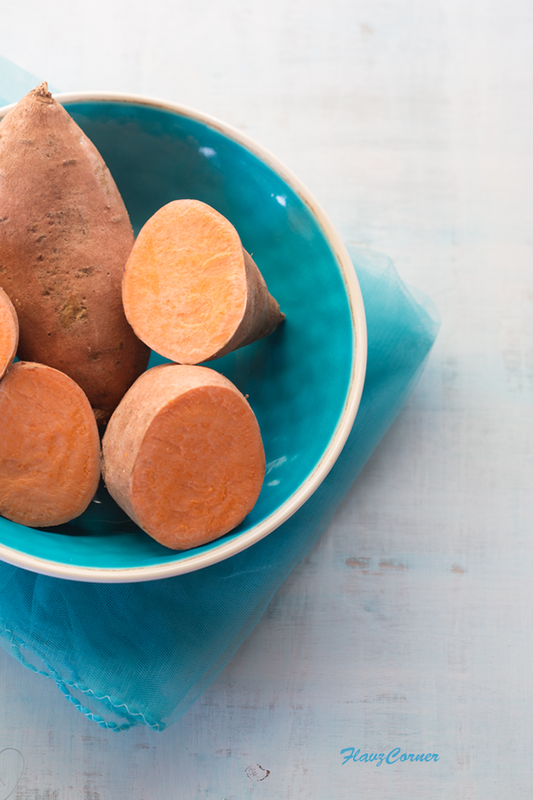 After 30 minutes check the sweet potatoes, it should be soft. If they are not soft and candied bake it for another 5 minutes. Take the ramekins out and remove the aluminum foil. 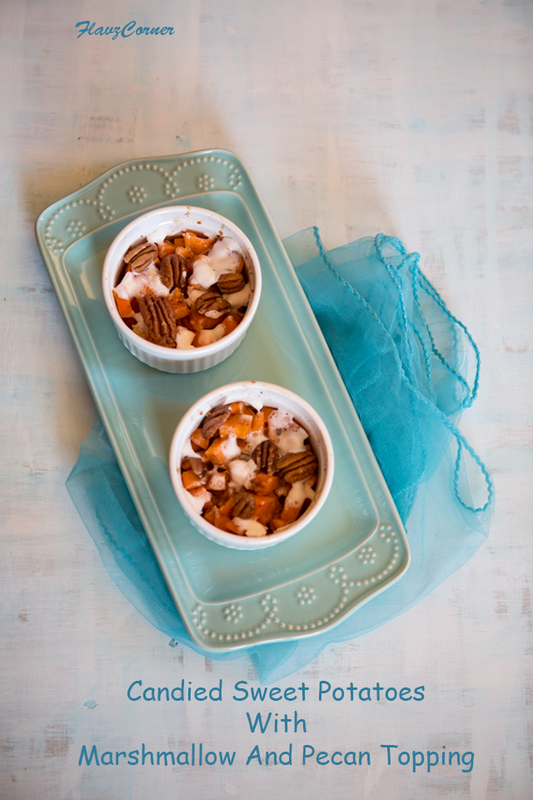 Arrange mini marshmallows and 5 pecans in each ramekins. Sprinkle nutmeg,orange zest and of brown sugar on the top of the marshmallow and bake till the marshmallow starts to melt a bit. It takes between 5 - 7 minutes. Serve them warm. Sounds really interesting... I really wonder how this would taste! I have never made anything like this...it surely looks very tempting! I love your blue bowl. These look absolutely delicious and gorgeous. Happy Thanksgiving to you. Thank you, this is so detailed!! It sounds amazing and I will be making it this week .